Nyhavn, Copenhagen. Photo credit: Marcin Young-Ziolkowski. 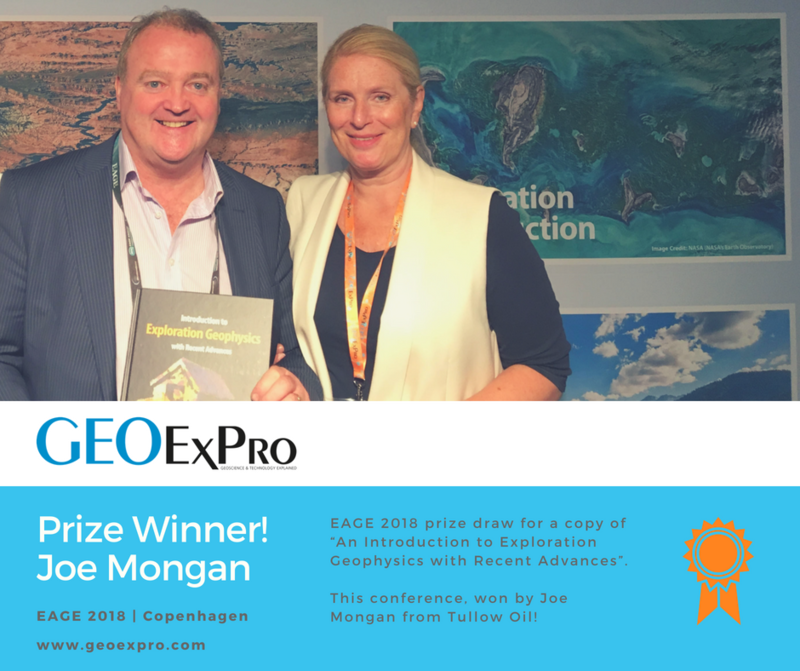 With over five thousand delegates, 275 exhibitors, 18 workshops, six short courses and three field trips, the organisers of the 2018 European Association of Geoscientists and Engineers annual conference can justifiably feel pleased with themselves. Held in the beautiful capital city of Denmark, Copenhagen, the conference and exhibition ran from 11th June through to the final talk in the late afternoon of Thursday 14 June. Even the sun shone on the event – although some of the exhibitors in the large, light, glass-roofed exhibition hall maybe found that something of a mixed blessing. The usual excellent range of conference talk topics was available with as many as nine separate strands running concurrently. These covered such diverse subjects as Full Waveform Inversion and Seismic Anisotropy to Enhanced or Improved Oil Recovery and Characterisation of Fractured Carbonates. Collaboration with the American Association of Petroleum Geologists (AAPG) meant that there were more geologically-oriented presentations than has previously been the case; as EAGE President Jean-Jacques Biteau noted in the opening ceremony, the geological content has increased to now represent about 40% of the total. 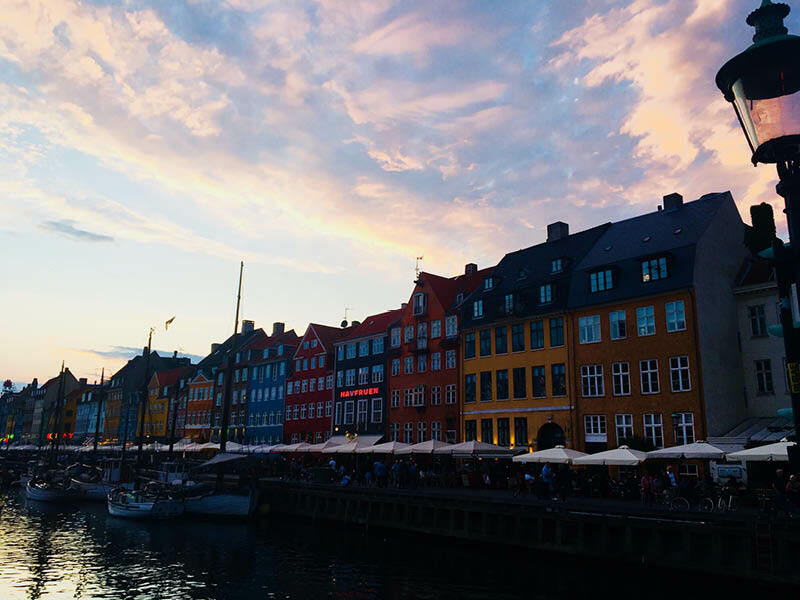 Nyhavn at night: a beautiful, harbour-side promenade of bars and restaurants - the perfect place to replenish! Photo credit: Nathan Young-Ziolkowski. The theme of this year’s conference was ‘Opportunities Presented by the Energy Transition’. In addition to the address from the President, the opening ceremony, graced by the presence of Prince Joachim of the Danish royal family, featured a very interesting debate on ‘The Role of Oil and Gas in the Energy Transition Era’. This provided an excellent and thought-provoking discussion, with representatives of Total and Equinor (formally Statoil), two of the foremost promoters of the energy transition among the major E&P companies, presenting their thoughts on the subject. It was fascinating to hear how these two companies have expanded their activities into renewables and how they see the links between demand and different routes to energy provision. Paul McConnell, Research Director Global Trends for Wood Mackenzie, also took part in this discussion, providing a more overarching worldwide view of the topic. in keeping with this conference theme, a new feature of the programme was a double session of talks on the topic of geothermal energy, which focused on how the geothermal and petroleum industries can jointly contribute to the energy transition by taking into account all the scientific, technical and social challenges related to the global climate change. Several new features and sessions reflected the way in which not just the E&P industry but the whole world is changing. A special executive forum convened a very high-ranking panel of industry senior managers and technologists to debate the challenges and opportunities presented by ‘Digitalisation of the E&P Industry: Status and Roadmap to the Future’, while another of these longer sessions with invited speakers looked at the role of integration in creating a more efficient industry. There were also special areas of the exhibition hall devoted to Digital Transformation; to Start Ups; to High Performance Computing; and to Coding, all of which seemed very busy and popular, particularly with the younger participants. A first at this EAGE was ‘Your Career Symposium’, organised by the Special Interest Community of Young Professionals of EAGE and sponsored by Saudi Aramco. Young professionals and graduating PhD students were invited to join this full day discussion on ways of developing or improving the skill set required to kick off their careers in the Geoscience and Engineering world. The Young Professionals community was also invited to a special session where speakers from industry and academia shared their experiences on how to explore and build leadership, teamwork, networking and communication skills. The Editor was particularly interested by another innovation; a session, led by experienced technical journal editors such as Phil Christie of the Journal of Petroleum Geoscience, on how to write an abstract in order to get it accepted by your journal of choice - and then how to turn it into a catchy article. Whilst a technical journal is very different to an ‘easy read’ GEO ExPro article, there are still some important ‘do’s and don’ts’ which apply to writing articles whatever the format. And following on from her Editorial in the most recent edition of GEO ExPro, the Editor attended the Women in Geoscience and Engineering special session, where Marit Brommer, Executive Director of the International Geothermal Association, gave a fascinating talk entitled ‘Driving your career in the energy transition: Ready, steady, go!’, illustrating it with examples from her own career. The ensuing discussion covered a wide range of related topics, illustrating both common issues and diverse experiences, illustrating the frequently repeated adage ‘no solution suits everyone’. The debate was wrapped up by Gladys Gonzalez, who in 2013 became the first female president of EAGE and who founded this EAGE women’s group. 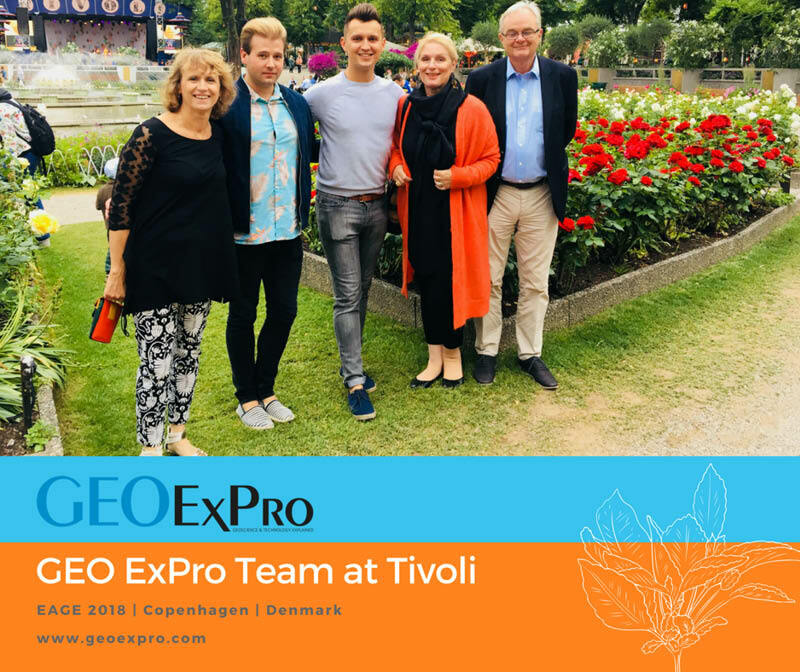 GEO ExPro Team at EAGE 2018. Here, enjoying Tivoli Gardens. Photo credit: Nathan Young-Ziolkowski. For exhibitors at this year's annual conference, the energy transition seems to have presented the opportunity for a modest refresh in booth design & brand. The Bella Conference Centre was awash of bright booth space and striking graphics, complementing the spacious central solarium and creating an inviting space for footfall to network and sit in on presentations & demos of the industry's latest interpretation technology. A first-time appearance from a Russian company brought with it a mammoth booth in the shape of the bow of an acquisition vessel with chilled tastings of the highest standard Russian vodka. In contrast we saw a rock flow dynamics software company present a brand new four-part animal-driven marketing campaign, equipped with soft toys to match! Needless to say these were a popular giveaway and a fantastic method for raising brand awareness and drawing attention to their latest software. A popular service company swapped its life-long blue booth for fresh, simplistic graphics complimented with striking primary colours which presented a clear brand refresh and communication of their corporate message. Each year we hold our annual ad lottery at the EAGE annual conference and exhibition, giving loyal clients the chance to win something back. 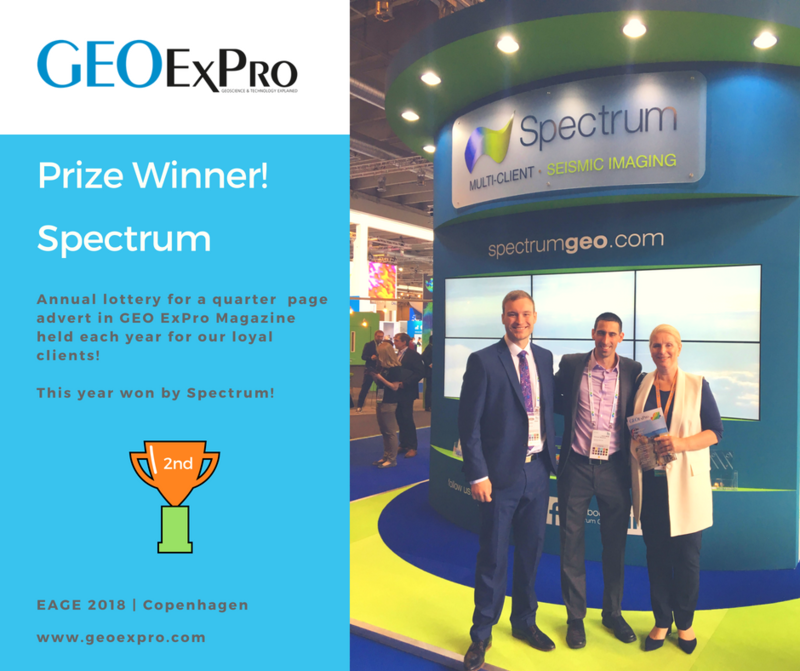 All qualifying clients were entered into a draw for the first place prize of a full-page print ad in an edition of this years GEO ExPro Volume 15. Victorious was long-term client, and first-time winner, Polarcus. In addition to the full page ad prize, we also held a raffle for the those who turned up to the initial prize draw. In addition to the qualifying criteria, in order to win the quarter page print ad the client had to be present at the actual draw. A big thank you to all those who turned up and the lucky winner from this draw was Spectrum. 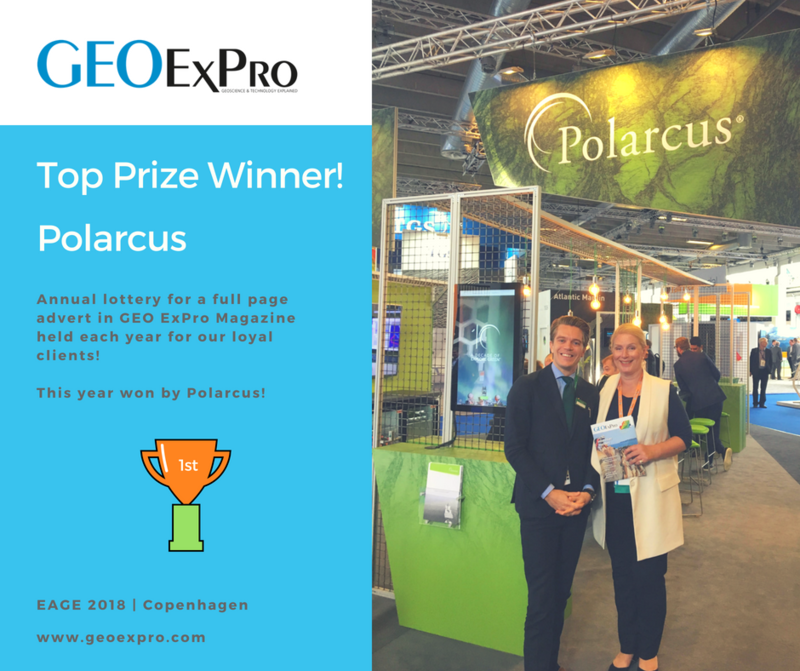 Top Prize Winners: Polarcus. Kirsti Karlsson pictured here with Erik Burlid from Polarcus. Photo credit: Nathan Young-Ziolkowski. 2nd Place Winners: Spectrum. Kirsti Karlsson pictured with Duncan Woolmer & Greg Reygate from Spectrum. Photo credit: Nathan Young-Ziolkowski. Winner of book prize: Joe Mongan of Tullow Oil. Pictured here with Kirsti Karlsson. Photo credit: Nathan Young-Ziolkowski. Becoming somewhat a tradition and trademark at our attended shows of 2018, we also offer a prize draw for a hardback copy of "An Introduction to Exploration Geophysics with Recent Advances", by long-term GEO ExPro columnists Martin Landrø and Lasse Amundsen as well as two sets of geological themed, handmade ceramic coasters. Despite tired feet and strained voices, conferences are the perfect opportunity to get the majority of your team in one place - especially if certain members are flying in from other corners of the globe! While it can be nice to get on with your own thing and take some time out in the evenings, there is absolutely no harm in spending a little more 'informal' time with your team. 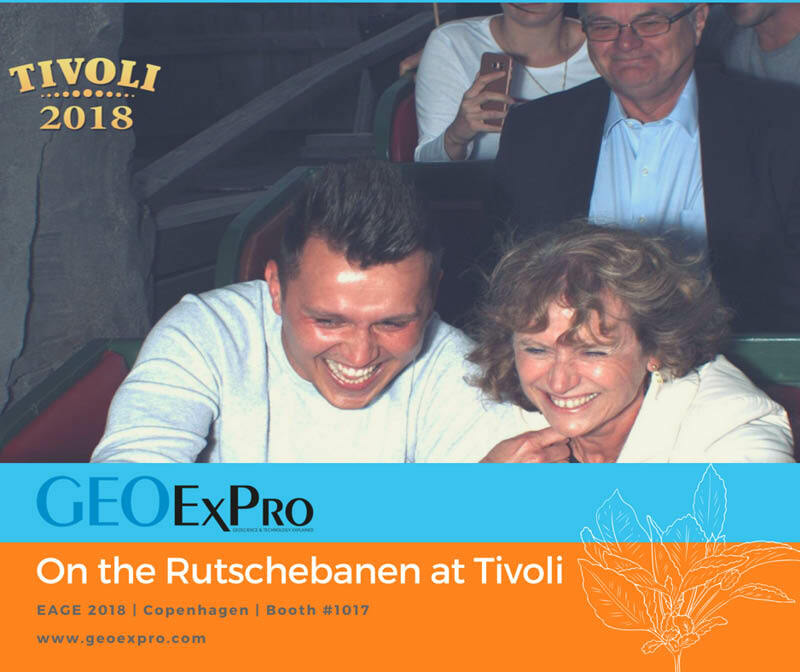 Team building is often thought of working collectively to solve puzzles and complete riddles, but at GEO ExPro we took the time to revel in the entertainments of one of the world's oldest operating theme parks, Tivoli Gardens, as it celebrated it's 175th Anniversary; enjoying rides and a tremendous dinner at one of Tivoli's resident micro-breweries, Færgekroen Bryghus. Dinner at Tivoli Gardens. 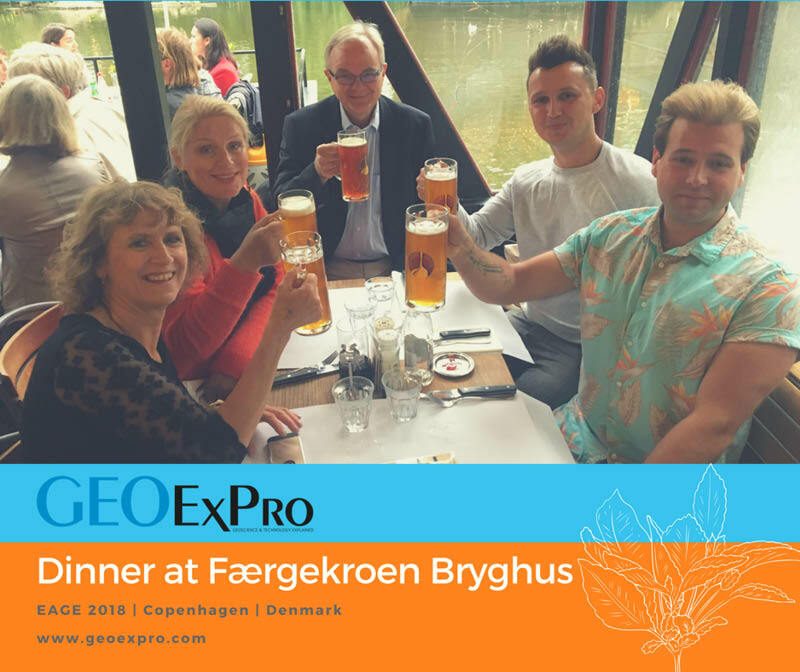 From left to right; Editor in Chief - Jane Whaley, Sales & Marketing Director - Kirsti Karlsson, Managing Director - Tore Karlsson, Booth Manager - Marcin Young-Ziolkowski, Sales & Marketing Manager + Digital Editor - Nathan Young-Ziolkowski. Photo credit: Nathan Young-Ziolkowski. 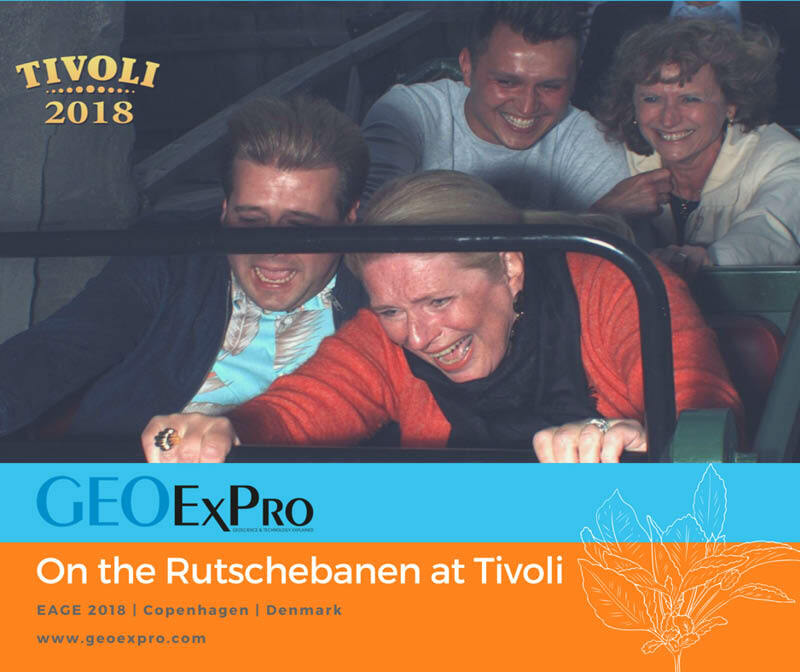 Fun on one of Europe's oldest working roller-coasters at Tivoli. Photo credit: GEO ExPro. 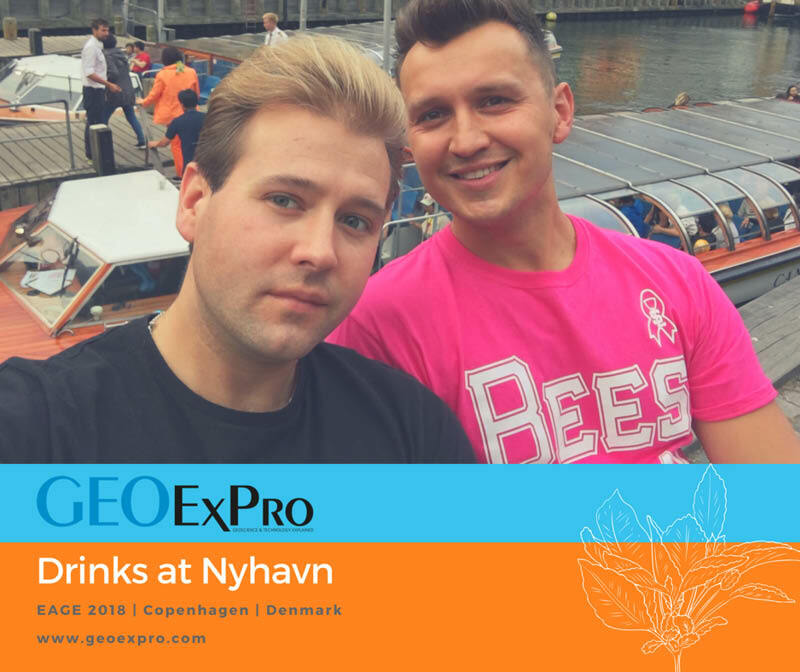 Post-setup drinks at Nyhavn, Copenhagen. Photo credit: Nathan Young-Ziolkowski. Of course, in addition to extra-curricular activities, we have the annual gala evening at the EAGE conference - this year hosted in one of Denmark's oldest locomotive repair warehouses. Dangling warm light bulbs filled the towering space above creating a cosy atmosphere complete with a live band, dancing, several bars and a good array of quality hot foot scattered throughout the warehouse. We hope you benefitted from the investment in your time at EAGE 2018 and we look forward to catching up at the next show!